So what’s the 2.0 stand for? 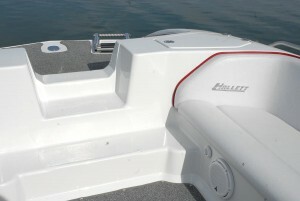 It’s the next generation in multi-tasking deckboats, the completely restyled Hallett 285 Party Cruiser inside and out. 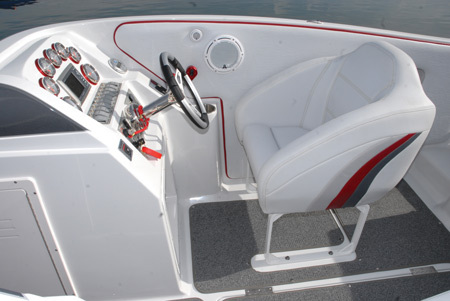 It’s the deckboat that doesn’t look like a deckboat, but still delivers all the functionality, performance, roominess and potential fun of ownership that you so richly deserve. You need to see this beauty in person and up close. Even better take a ride. It isn’t everyday you get an opportunity to own the deckboat of tomorrow today. A good idea? You bet it is. 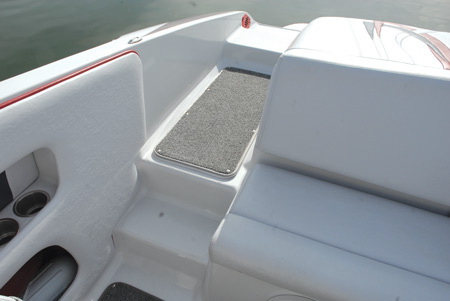 A companionway between cockpit and swim platform is a must for any well designed deckboat. Loose gear and equipment in the cockpit is annoying. 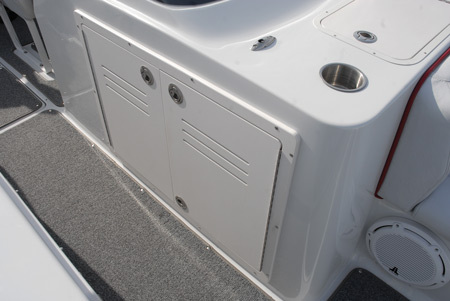 Hallett makes sure that doesn’t happen with ample on-board built-in storage space. You want bow and stern easy access? Hallett gives it to you and then some. Forget the struggle to get on and off at the beach with a handy retractable boarding ladder.